With these quotations I do not mean to suggest that I feel unfairly treated by my publisher. Rather, that critical editions are usually multi-year projects, necessarily a labor of love, and not for those who can come up with anything better to be doing with their time. For those in academic positions, it seems most promotion/tenure committees do not regard critical editing as sufficiently “original” to be valued as significant scholarly work. Worse still, the sort of unfairness Sayers describes of the Inland Revenue is even worse in an academic’s Annual Performance Review: while many different academic projects take years, most—whether scientific laboratory research or data gathering and analysis or a humanities monograph—at least yield some substance that can be used for conference talks or provisional articles along the way. It is the nature of an edition that it’s usually all-or-nothing: until it is finished, there is very little to show for it about which a committee would care. 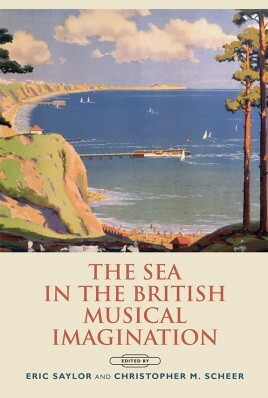 Ultimately, I suppose my project started in May 2009, when Christopher Scheer and Eric Saylor contacted me about writing a chapter for a book they were planning, to be titled The Sea in the British Musical Imagination. (That book happened, published by Boydell & Brewer in December 2015.) 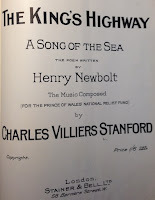 The chapter I proposed looked at musical characterization of British sailors from the 1870s into the 1920; among the works I wanted to consider were two orchestral song cycles by Charles Villiers Stanford: Songs of the Sea (1904) and Songs of the Fleet (1910), both to texts of Henry Newbolt. As I worked on my chapter (mainly in 2010-11), I was frustrated by the lack of any good editions of these works. My only sources for the chapter were the published vocal scores of both works, and the 1905 published full score of Songs of the Sea; there was no published full score of Songs of the Fleet. March 2012: I pitched the idea of a new critical edition of both works to the music department at Oxford University Press (with whom I had been working on two volumes for their Walton critical edition, and because OUP was actively putting out editions of British music—particularly Sullivan and Vaughan Williams). OUP turned me down, as did Musica Britannica subsequently. I was a little surprised, as these two pieces—particularly Songs of the Sea—have a continuing presence in the British orchestral repertory. They reveal Stanford at his most populist; he would certainly have regarded them as potboilers, necessary as he never had the financial security that his colleage Hubert Parry had enjoyed. The award-winning 2006 recording by Gerald Finley (under Richard Hickox) brought renewed attention to these works, and he performed Songs of the Sea at the 2018 “Last Night of the Proms.” Finley's superb performances notwithstanding, in my opinion the 1983 recording by Benjamin Luxon (under Norman Del Mar) is still finer; here’s a taste of it. 28 July 2012: While at the meeting of the North American British Music Studies Association, I had an encouraging conversation with Pamela Whitcomb of A-R Editions. They had recently published Stanford’s Cello Concerto and I admired the quality of their work. I knew it would be some time before I could get to work on the project (especially with two kids under three years old), but I added preparing a proposal to my to-do list. 28 March 2014: I was in the UK for a reception to celebrate the completion of the William Walton Edition, and took an afternoon inspecting Stanford’s autograph scores for both works at the Royal College of Music. From what I saw, I knew that a critical edition was needed. So I started gathering the necessary materials. Thinking this would be an ideal sort of undergraduate research project, I also invited my student Edison Kang to join me as a coeditor—warning him that it would not be complete until years after his 2015 college graduation. A copyist’s full score of Songs of the Sea, made for Henry Wood, and much marked-up by him (held by the Royal Academy of Music); we knew this source probably existed, as Wood conducted the work in January 1905 before the work had been published in full score, so we looked for it among Wood’s scores at the RAM and there it was. I had borrowed the performing materials of Songs of the Fleet from ECS publishing (the US distributor for Stainer & Bell); these ultimately proved worthless for the edition, as all but the string parts were a mid-20th-century copy with no authority. Still this led me to seek out the set of parts that would have been sent to Australia along with the score that I had already located. Google-searching led me to Symphony Services International, a firm which now holds the orchestral library of the Australian Broadcasting Commission, from which the score in the National Library had apparently come. An exchange of e-mails in early October revealed that they had a set of parts to Fleet but no corresponding score. Upon investigation—acquiring scans of the parts—the lost material was identified and (if only as printed out scans) reunited on a table half a world away. Scans of our primary sources for Songs of the Fleet: (top row, L-R) manuscript wind/brass/percussion parts sent to Sydney in 1910; lithographed string parts (ditto, but apparently still on hire from Stainer & Bell); 1910 published vocal score; (bottom row): copyist’s full score sent to Sydney in 1910 with the parts; Stanford’s autograph full score; Stanford’s autograph vocal score. 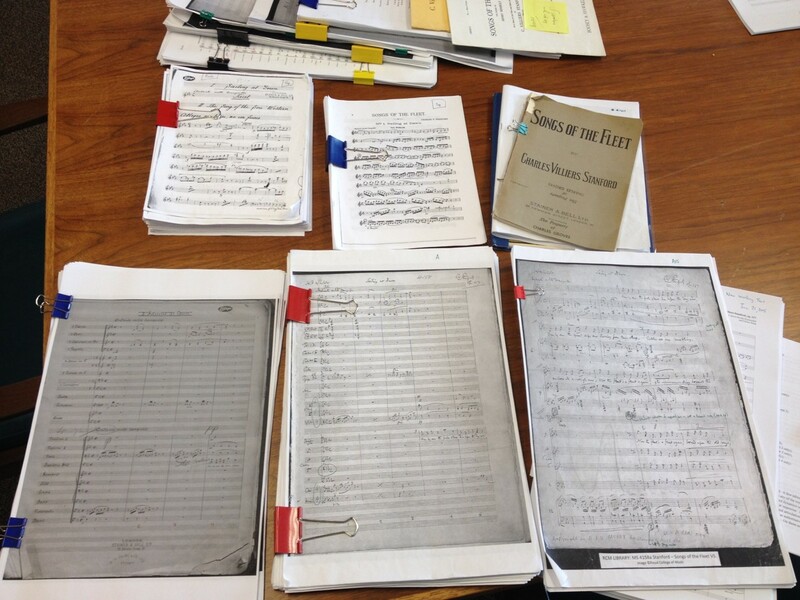 May–July 2014: While still gathering sources, the early summer was spent preparing a working text of each work—a Finale file for each movement transcribed from the scans of Stanford’s autographs. I sent Edison copies of everything for Songs of the Sea-—which was to be his main part of the project—on June 24. September 2014: In the first weeks of the fall semester, Edison and I scrambled to get the proposal ready for A-R. It was tricky, as they wanted to see a lot of the work upfront, even though this was before we had time to really get to work. 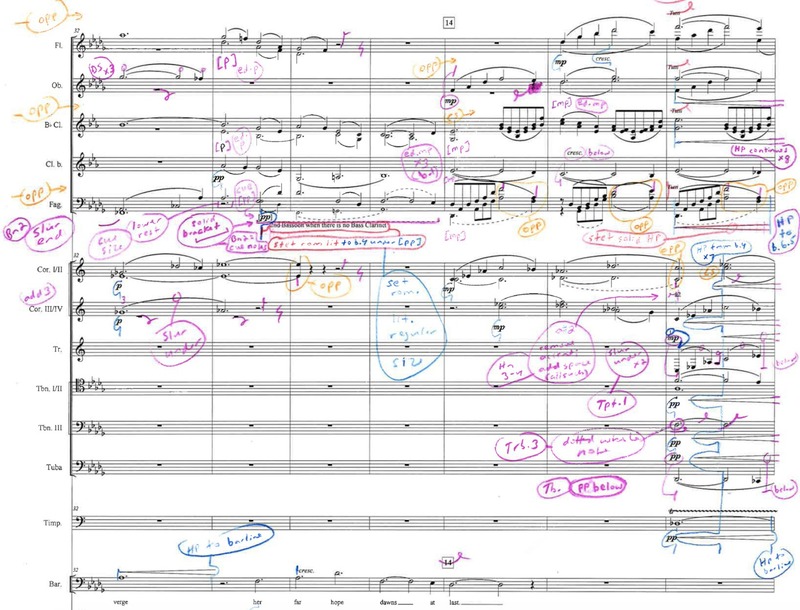 I hastily prepared three movements of Fleet, pointing out textual differences between the published vocal score, the composer's autograph full and vocal scores, and the Australian full score (as we didn’t yet have the Australian parts). 15 October 2014: We submitted the formal proposal of the volume to A-R Editions; although we did not get the contract until September 2015, A-R had accepted the project in April 2015. 23 October 2014: An e-mail reply from RCM librarian Peter Horton indicated that the performing parts of Sea in their collection were from the estate of Plunket Greene, the singer for whom both cycles were written. This discovery would necessitate an on-site inspection, so I added that to my list of things to do in February 2015 when I would be back in London for a conference. January 2015 was the beginning of the real editing work: collating the readings of all available sources to settle on our new text, while at the same time evaluating the relative authority of each of the sources. This involved checking and re-checking (and re-checking it twice) between the composer’s full scores and piano/vocal scores, the earliest available sets of performing parts, the early copyists’ scores, and the first edition vocal scores, all the while documenting every variant reading--and, moreover, following up every conceivable rabbit trail. An example we stumbled across by way a Google search: a performance of Songs of the Sea by the (amateur) Stock Exchange Orchestral and Choral Society, which made ripples in the press for a few weeks because the amateur group played at the old (high) pitch and Plunket Greene thus refused to sing it. (I managed to get an independent publication out of this: the story was too complicated to detail in our preface of the edition but would be handy to cite, so I wrote up a separate piece for the Newsletter of the American Musical Instrument Society, available here.) We also had to secure permission to publish the discarded original endings of two of the movements of Songs of the Fleet: unpublished, the copyright for these few bars remain the property of the Royal Society of Church Musicians, who was gracious enough to allow us to include them in our edition. This process consumed thirteen months, off and on. We kept a list of specific questions to check when I would next be back in the UK in December 2015, going through archival material of the Leeds Festival (where both works were premiered) and checking the RCM materials again, as well to revisit tertiary sources at the British Library. 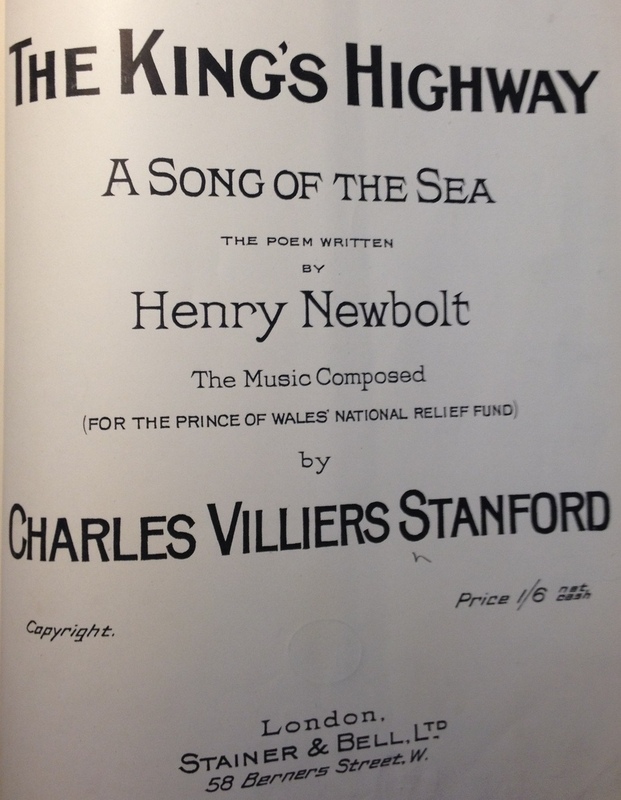 (That trip also turned up an additional “Song of the Sea” by Newbolt and Stanford, written as a fundraiser in the early days of World War I. We included it in our edition in an appendix.) Edison was on-site for the first five months of our editing, after which we collaborated remotely. He returned in January 2016 for a week of intense proofreading. 10 February 2016: We submitted the complete edition to A-R, a few days ahead of our self-imposed deadline. And then we waited, as we knew A-R had a number of other projects in line before ours. And then it was basically radio silence for almost two years. 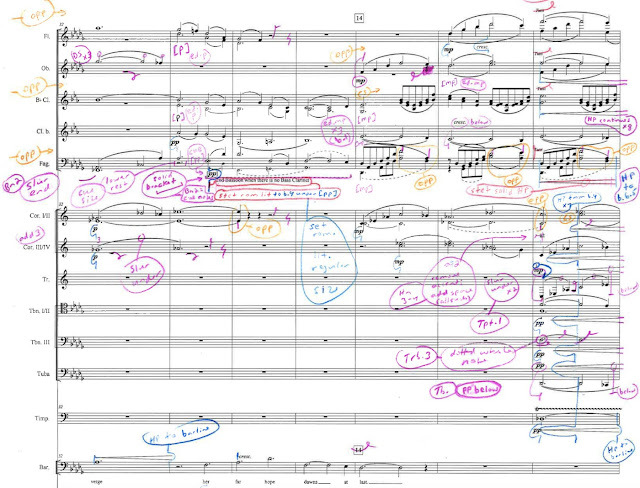 During that interval, I started the Settling Scores blog—itching for something else to do, I guess. In mid-July the manuscript went back to A-R, and for a month there was some back-and-forth about individual points. In mid-August, A-R dispatched the finalized text to be professional set in their notation program. 26 October 2018: The proofs arrived. We had a six-week window to check them, and it proved very difficult during the academic term. Responses were returned on 30 November, and after two weeks of e-mailing back and forth about a few contentious points, the corrections were sent on to the setter. 4 January 2019: We received an e-mail that the second proofs were completed (in-house) and that our edition had been sent to the printer. In the course of all of this, Edison and I have had major life changes: both of us have moved and changed jobs; Edison has gotten married, and babies have arrived in both families (mine in June 2014 while I was preparing the working copy (and now almost in kindergarten), and Edison’s in November 2018 while we were checking proofs). I have learned so much in the process. My previous editing projects had been much more straightforward and without the source complications posed by these works. A-R helped us to think through the implications of every policy decision. While there are ways in which I am not satisfied with the imposition of their house style, as I write now they seem like such petty details—“too few to mention,” as Frank Sinatra used to sing. The overall improvements that A-R made to the final product far outweigh their alterations from the way I wanted it presented. “A labour of love—and probably a flop!” as Sayers described The Nine Tailors. One doesn’t go into editing for the money, as by the time I add up the expenses of acquiring the resources and making the research trips, it is ultimately a money-losing activity. Still, I’m delighted to see it come to fruition; and, while I await the Wells Fargo wagon, I'm still gladder I don’t have an impatient tenure committee waiting on it too.